Handel's 'Messiah' from Philadelphia From the Kimmel Center in Philadelphia, WHYY and NPR present Handel's holiday masterpiece performed by the "Fabulous Philadelphians" — one of the world's greatest orchestras, joined by the nationally renowned Philadelphia Singers Chorale. British choral master Richard Hickox conducts. Conductor Richard Hickox takes a breather backstage in the NPR control room with with hosts Fred Child and Melinda Whiting. NPR station WHYY and the world-renowned Curtis Institute of Music have teamed up for an innovative program to record and telecast graduation recitals at Curtis' Field Concert Hall. Nearly half of the Philadelphia Orchestra is made up of Curtis alumni. Used by permission of the Curtis Institute of Music & WHYY. With José-Maria Blumenschein, Johannes Dickbauer, Lily Francis, Michael Haas, and Alexander Martin Hanna. Handel's Messiah in Concert at the Kimmel Center: Richard Hickox conducts the Philadelphia Orchestra, the Philadelphia Singers Chorale, and soloists (L-R) Laura Claycomb, Catherine Wyn-Rogers, Bruce Ford, and Neal Davies. Bass-Baritone Neal Davies sings "The Trumpet Shall Sound" live in concert during NPR's Messiah broadcast. Historic 1958 recording session with Eugene Ormandy and the Mormon Tabernacle Choir. From the Kimmel Center in Philadelphia, WHYY and NPR present Handel's holiday masterpiece performed by the "Fabulous Philadelphians" — one of the world's great orchestras, joined by the nationally-renowned Philadelphia Singers Chorale. Acclaimed British choral master Richard Hickox conducts. Hosted by Fred Child and Melinda Whiting. Messiah, the most famous oratorio ever written, is quite unlike Handel's other ones, let alone those by most earlier and later composers. A German who initially made his fame writing Italian operas for English audiences, Handel found in the 1730s that the public wanted something new and more understandable. After composing some three dozen Italian operas, works of great musical brilliance but often dramatically inert and set to mediocre librettos, he shifted his energies to creating what are in essence sacred English operas. The performance venues in which Handel's oratorios were originally presented, the performers who participated, and the audiences that attended were pretty much the same as those previously connected with his operas. It was a natural shift for Handel, a man of the theater. The principal differences between Handel's operas and oratorios are that the stories are usually religious, often biblical, and that oratorios were not staged—no sets or costumes. They both tend to open with a so-called "French Overture," followed by various recitatives and arias. Castrato singers, the superstars of the day, were also shared features. One of the most vocally elaborate and dazzling moments in Messiah—the fast section of "But who may abide the day of His coming"—was revised from its original version featuring bass voice for the famous alto castrato Gaetano Guadagni and made into a real showstopper. Most of the musical elements were interchangeable between opera and oratorio, although the role of the chorus became much more prominent in the latter, often carrying nationalistic resonances as representatives of the people. Handel the dramatic composer, therefore, is still very much in evidence in his oratorios. If his theatrical sense did not change, he nonetheless was able to adapt to new circumstances after interest in Italian opera waned and the success of The Beggar's Opera (1728) demonstrated public desire for simpler fare given in English. Handel quickly enjoyed considerable success with oratorios such as Esther, Deborah, Saul, and Israel in Egypt. But by the early 1740s, he was in some financial difficulty and suffering from poor health after a stroke. At this low point in his career he composed what would become his most famous and beloved piece and one that is probably the oldest work to remain consistently in the repertory of so-called "classical music." Unlike his operas or Bach's passions, Messiah never needed to be revived because it never disappeared. The title of this celebrated composition gives some indication of its basic difference from most of Handel's other sacred stories in sound: Messiah, not The Messiah. He did not write a narrative drama about the birth, life, death, and resurrection of Christ (the latter parts the subject of musical settings of the Passion, such as those by Bach), but rather offered a mediation on the idea of a Messiah, for which reason some of the text is derived not from the New Testament but from the Old, as well as from the Psalms. Later parts of the oratorio then offer episodes dealing with Christ's birth, sufferings, death, and resurrection. While Handel's oratorios usually had characters and a clear narrative, Messiah does not. Soloists are still used, but for their vocal qualities rather than to represent specific individuals or the relationships, conflicts, and confrontations among them. This change in approach was commented upon by Handel's contemporaries, one of whom noted that Messiah "although called an Oratorio, yet it is not dramatic but properly a Collection of Hymns or Anthems drawn from the sacred Scriptures." Various legends, registering differing degrees of reality, inevitably surround such a famous and long-lived composition. It is known that Handel wrote most of the work in some three weeks time, secluding himself beginning on August 22, 1741. Such speed was typical of the composer, who after finishing Messiah immediately turned to writing the oratorio Samson. Another legend attached to the work relates to his inspiration, which casts the frenzied composition as a sort of divine dictation. Handel is said to have emerged at some point (usually, it is noted, after finishing the "Hallelujah" chorus,) and proclaimed: "I did think I did see all Heaven before me, and the great God himself!" A practical reason that Handel could compose this work and others so quickly was that he often drew upon music composed earlier. While self-borrowing was far more common in the 18th century than it became once the cult of originality emerged in the 19th, Handel took it to new extremes, not to mention borrowing a large degree from other composers as well. His practices aroused attention in his own day, even from his collaborator Charles Jennens, who deftly compiled the libretto for Messiah. The borrowings in Messiah, which for the most part come from Handel's own works, are fascinating as they invite us to reconsider the "inspired" relation between the words and music. The music for the joyous chorus "For unto us a Child is born," for example, which seems so perfectly to capture the celebratory words from Isaiah, was originally written for a profane, indeed frivolous, duet for two sopranos castigating "blind Cupid" and "cruel beauty." There are other such examples from Messiah, which in no way diminishes the glory of the music, but does help to explain how Handel could compose so rapidly. It should make us somewhat cautious in talking about the sources of the composer's inspiration. The first performance of Messiah took place not in London, but rather in Dublin, on April 13, 1742. Handel gave the London premiere less than a year later at Covent Garden. It was not well received, in part because of objections to presenting a sacred work in that most profane of buildings—a theater! (Handel had advertised the oratorio as a "musical entertainment.") It was only in 1750, when Messiah began to be presented in annual performances for a London charity at the local Foundling Hospital, that the public embraced the work. Handel performed it some three dozen times—every time, it should be noted, around Easter, not Christmas, as later became the custom. 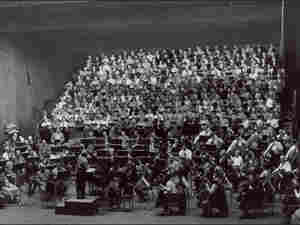 Over the years he revised Messiah to accommodate new surroundings, performing forces, and audiences. Such adaptations have continued ever since: Mozart re-orchestrated the work in 1789 to bring it up to the dimensions of a Classical period orchestra, and more "heavy metal" versions would come in the 19th and 20th centuries. Many of these later arrangements helped to make the work viable for large choral festivals with many hundreds of singers, sometimes even more than a thousand. Messiah is divided into three sections. The first is concerned with the prophesy of the coming of a Messiah and then with Christ's Nativity. Part II deals with Christ's suffering and death. The concluding section offers an affirmation of Christian faith and glimpses of Revelation. In the selection being performed on today's program, Part I forms the first half of the program, Part II begins after intermission and continues until "Hallelujah," and Part III begins with the aria "I know that my Redeemer liveth." Program note © 2006. All rights reserved. Program note may not be reprinted without written permission from The Philadelphia Orchestra Association.